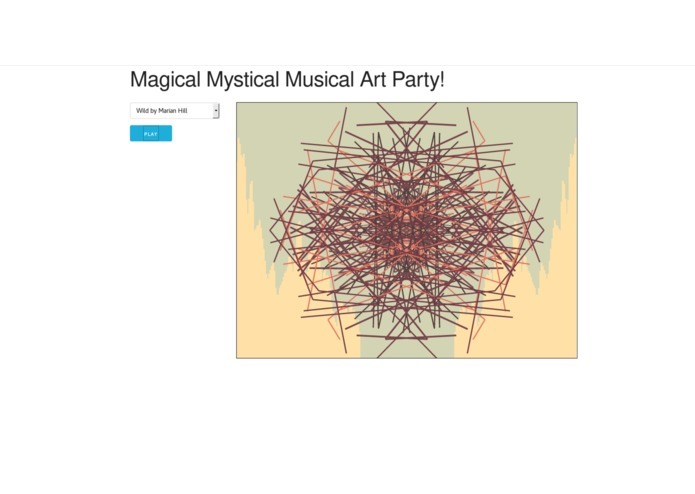 It's a non-interactive additive musical art experience - also known as a visualizer. We explore how symmetry and randomness, combined with rhythmic input, can create a controlled, consistently augmenting artistic experience. What is art, anyway, if not a series of rules applied to random noise? We rest our case. Just check out those shapes, tho. With Python on the back-end, and lots of love there too. With JS on the front-end, less love. HTML and CSS to sweeten the deal. Literally everything. Colors were an issue. Shapes, even more so. Ryan can't even see either, so that's rough. Dank beats, dank shapes. Turned out better than we expected! Art is not so easy after all. OR MAYBE art IS easy after all. It depends on if you view this as art or not. Maybe uploading your own songs, that would be neato.